SOAR — Why Rise Up? Become your best you. Overcome your obstacles. Strive for success. That’s what RISE UP means. THAT is exactly what we want to instill in our children at SOAR! We strive to give them chances to serve, experience new opportunities, and improve their academics and recreation. We want to educate our students and inspire them to dream big dreams! We want them to see themselves as great, and understand that they can impact the world in whichever way they choose if they truly want to. This looks a little different for every child though. They won’t have all of the same dreams, desires, and hopes. So therefore, RISE UP, and that definition, has to look different for every child. 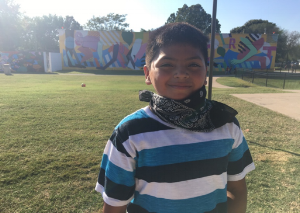 Miguel is a 5th grader here at SOAR and he says that RISE UP means to grow in kindness and not be a bully, but to make sure that you stop bullying from happening. Melissa, also a 5th grader, says that RISE UP means to RISE UP from the darkness and be courageous, and to show that you are someone mature and responsible. Aby, a 2nd grader, says that to RISE UP means to be courageous and try new things! Let others know that they are not alone, like someone has their back and believes in them to accomplish what they are currently working on. Even though RISE UP looks a little different for every single child, the basis of it is this: we want them to feel confident and capable to move through and past their circumstances to become whatever they see that they need to be. That might look like being a friend. That might look like being an astronaut. But wherever each child is at in becoming the best person they can be, we want to walk alongside them. We want them to feel like they are not alone, like someone has their back and believes in them to accomplish what they are currently working on. That’s why we challenge our students to RISE UP. Older PostGrace Hill Skate Club!